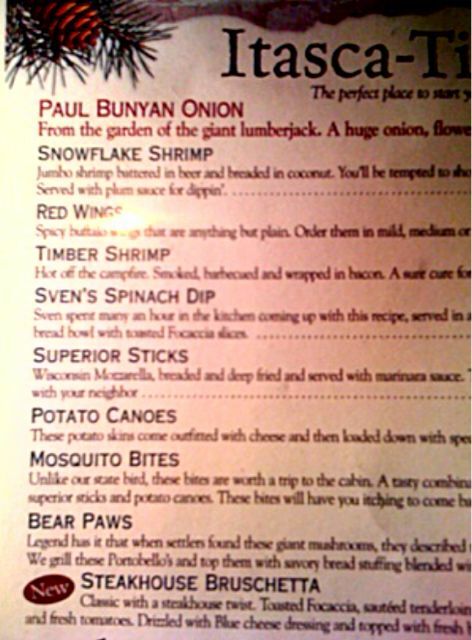 Where else but in Minnesota can Mosquito Bites, Bear Paws and Timber Shrimp be a good thing to eat ! Yesterday Liz took the day off of work to hang out with mom and we had a blast!! One of the places we went to eat was a very Northern Minnesota steak house with a fun twist and a great happy hour! Check out the fun appetizer menu!! I caught Liz in a shopping frenzy moment here at TJ Max after we got our nails done at a local salon. We got a kick out of the salon owners whos business was very slow because of construction in their parking lot. They kept telling us things like “your feet look terrible” and “I will wax your chin” even though a single hair never grew on my chinnie chin chin!! !…………they needed the few dollars really bad so we had the works done. Now I am paranoid I had a hairy chin all along and just couldn’t see it because of my bad eyes……….lol….boy boy boy the power of suggestion is strong. Great sales woman she was…you bettcha!!!! Now this is something we rarely see in Portland….a THUNDERSTORM!! Diana hears me whining all the time about the fact we get no downpours or thunder/lighting. This beauty came through when we were grocery shopping and made the hair on my arms stand on end it was so ominous. Actually come to think of it now, maybe the salon lady should have waxed those arms too!!!!!!!! WALL CLOUD……no such thing in Portland Oregon!!!! All we get is drizzle!! Liz is a girl after my own heart! I LOVE handbags…and shoes, of course. Tom says he has only one wallet and can’t for the world understand why I should need more than one handbag. (I don’t even bother to tell him that I, too, have only one wallet.) How many bags did Liz buy? We are enjoying our monsoon thunderstorms here in Arizona. Almost every afternoon the towering cumulus clouds build up to 30K and 40K storm. They storms last about one hour and then the sun comes out producing beautiful rainbows…sometimes double rainbows. Sounds like you are having a great time! Looks like you’re having fun! Tell Liz I love that green handbag. I know exactly what steak house you were at. Ryan and I quite often drive just over the MN border to eat at one, it’s one of our favs! It’s funny to think you never get to see thunderstorms, we have them so often. I should send you some of my cloud pics. Hey ladies!!! How goes it??? Liz toiled over that green handbag . It was regularly over 400.00 and was 65.00 at TJ MAX. She had an armfull of other clothes , shoes etc. so I told her if she didn’t get all the clothes she didn’t need, she could really justify the handbag………so you know the story from there!! It’s hers!! Oh Jan I would love to see those double rainbows. We saw them over Victoria Falls in Zimbabwe and they were surreal!! Can’t wait to see you and M-S tomorrow Sarah!! Wish all my friends could have one big reunion with us tomorrow!!! Wish Diana, Jan and Cathy lived closer!!!!! !